Adobe Illustrator celebrates its silver anniversary this year, and it’s remarkable to consider that this vector illustration application has been with us for a full quarter-century. Illustrator CS6—the 16th release—cements the app’s longevity with an interface overhaul, engine tune-up, and three major new creative features: Gradient Strokes, Pattern Creation, and Image Trace. Illustrator CS6’s most obvious revision is its refined interface. The app has shaken off its glossy aqua pop-up menus and adopted a low-contrast and gorgeously consistent greyscale chic. With that, Adobe has redrawn icons, reworked toolbars, and tidied panels. Users can adjust the interface incrementally from bright to dark, and the new low-contrast design renders darker interface modes as more pleasing to the eye than in CS5. (CS6 can go a step darker than CS5, too.) Additionally, the canvas color can now be keyed to match the brightness of the interface, toning down the white expanse on either side of the artboard. 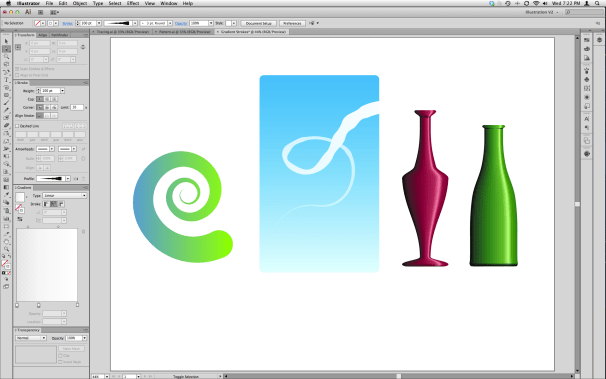 Illustrator CS6’s updated interface is low-contrast, incredibly consistent, and scalable from light to dark. There’s just one hitch with the new interface: Everything is bigger. Toolbars are wider and panels are beefier than in CS5. (The Strokes panel is 16.5 percent larger, for example.) That’s unlikely to concern anyone with a big display, but users with smaller displays may find that this swelling of the interface further squeezes their already cramped canvases. 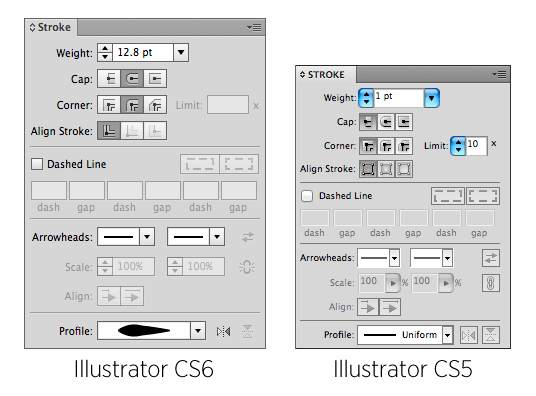 Illustrator CS6’s interface elements are larger than in previous versions. In addition to the aesthetic tweaks, a number of notable changes help you accomplish common tasks with less clicking. At long last, you can edit layer names directly in the layers panel, without having to invoke a pop-up window. Panels such as Transform, Transparency, and Character now have extra options to help you avoid frequent trips to the menu. Exporting artwork via Save for Web has been streamlined, too. In CS5, resizing artwork on export required you to click the Image Size tab and then click Apply; in CS6, Image Size is always visible in the sidebar and changes take effect automatically. Adobe considers Illustrator CS6 a particularly important release because it marks the application’s migration from 32-bit to 64-bit. This tune-up brings modest performance gains, along with the ability to address all available memory on your Mac (instead of just 3GB). And leveraging extra memory can help ward off out-of-memory errors when working with extremely complex documents. In practice, the performance boost varies with the complexity of your artwork. If your designs are simple, you’re unlikely to notice much of a change. However, if you regularly create artwork that contains thousands of objects, numerous gradients, and effects such as Gaussian blur, the performance gains will be much more obvious. In casual testing, I observed a speed boost in redrawing and saving complex artwork of approximately 20 to 25 percent. Adobe’s included sample files demonstrate this small boost quite well, particularly with the extremely intricate Mischievous Venus: Illustrator CS5 takes approximately 12.5 seconds to save the file as a copy, whereas Illustrator CS6 takes just 9 seconds. New 64-bit coding lets Illustrator address all available memory on your Mac. 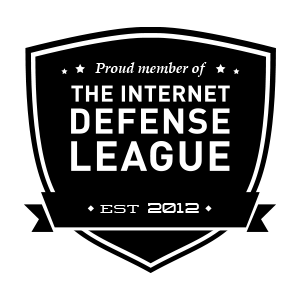 This helps ward off out-of-memory errors when working with complex documents. One welcome addition to the Illustrator toolset is Gradient on Strokes. As the name suggests, this new feature lets you apply a gradient—instead of just a simple solid color—to any stroke you draw. Gradient Strokes can be applied in three ways. The first method is within a stroke, so that it flows across the entire stroke in a strictly linear manner. This is close to what you’d get if you converted the stroke to an object and then applied a gradient, except that you can easily edit the stroke at any time. Gradient Strokes allow you to apply a gradient to any stroke to quickly create items like vapor trails and glossy bottles. The second method is along a stroke, which flows the gradient through the stroke from end to end following the trajectory of the stroke, even if it loops over itself multiple times. This kind of gradient opens up new possibilities for vector artwork, including the ability to create an airplane vapor trail looping through the sky, bright and white near the tail of the plane and becoming increasingly transparent as the trail peters out. Gradient Strokes using round caps are occasionally glitchy, displaying lines across each end of the stroke. The last and perhaps most useful method is across a stroke, which flows from one side of the stroke’s width to the other. This narrow application of the gradient can significantly cut down the amount of work required to create a curved surface with sheen. Let’s say you want to create a plastic bottle with a highlight running along its left side. In CS5, you’d need to overlay multiple gradients or rely on complex blends to create the effect. In CS6, you need only draw a vertical line, carve out the shape of a bottle using the Width Tool, and then apply a gradient across the stroke. It’s remarkably easy. The only snag I encountered with the feature was when using strokes with round caps, which sometimes show faint seams across each end of the stroke. The seams are more apparent when the gradient contains transparency; hopefully, the company will soon issue a fix. 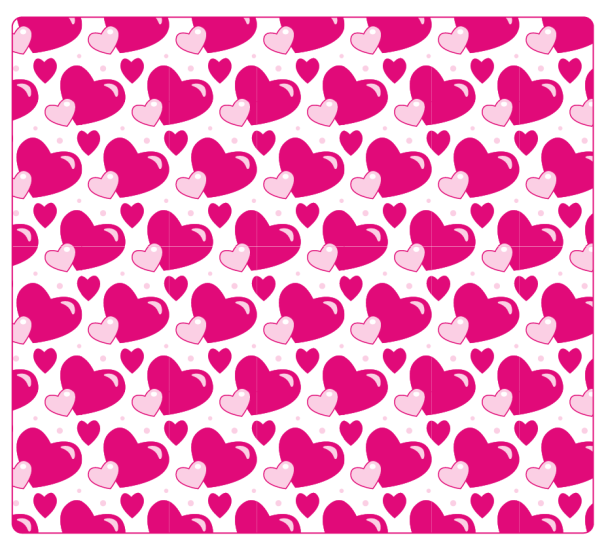 Let’s say you want to create a pattern of pink hearts for a greeting card. You can start with a single heart object and choose Object -> Pattern -> Make. 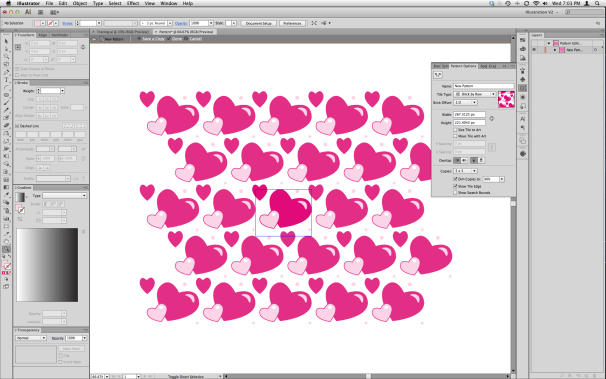 Once in the Pattern Editor, you can then replicate the heart object by rotating, resizing, repositioning, and recoloring the copies as needed. As you make changes, the pattern preview updates in real time, allowing you to position the hearts in just the right places. You’re also free to place the hearts partially outside of the tile edge—anything that flows beyond the boundary on one side will flow into the boundary on the opposite side of the pattern. 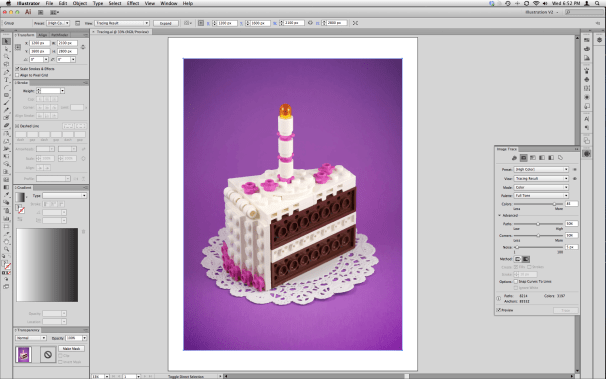 Illustrator CS6’s Pattern Editor makes it easy to generate an intricate pattern. The Pattern Options panel provides a number of tiling methods such as Grid, Brick, and Hex, and you can control the degree of the pattern offset for both the Brick by Row and Brick by Column menu items. With your heart pattern, you’ll want to choose one of the offset tiling methods to avoid a grid-like appearance. You can also tweak the tile size (adding in margins, if you wish) and specify the directions in which the heart pattern overlaps. Clicking Done at the top of the document window saves the pattern to the swatch panel, and from there you can apply it to any object. Most importantly, the pattern can be edited at any time by simply double-clicking it in the swatch panel. Illustrator CS6’s pattern creation tool makes very quick work of otherwise complicated pattern-making, with one important caveat. Adobe has acknowledged that there is a redraw quirk within the application that shows seam lines in patterns, but insists that this redraw issue does not affect exports or prints. However, in my tests I observed that these seams are sometimes carried over to Save for Web exports, and can also appear when the Illustrator file is opened in Photoshop. This is especially frustrating if you’re attempting to create seamless Web backgrounds using the Pattern Editor. Digging deeper, I discovered that the source of the problem is pattern tiles that have dimensions with decimal places; i.e., 97.332 by 97.332 pixels rather than 100 by 100 pixels. Simply put, pixels in a pattern must be displayed at a 1:1 ratio (or multiplied by a factor of 2) in order to avoid visible seams onscreen and, more importantly, in file exports. Until Adobe addresses this issue, restricting the tile dimensions to whole numbers (and adjusting existing pattern tiles so that the dimensions are whole numbers) is the best way to avoid unsightly seams. Unfortunately, patterns often show seams onscreen. And if the pattern tile includes decimal measurements, the seams are carried over into file exports like Save for Web. In Illustrator CS5 and earlier, Live Trace let you auto-trace a raster image in order to convert it to vector format. Unfortunately, the tool was unwieldy and users often wrestled with obtuse settings without getting usable results. Adobe has changed this with Illustrator CS6 and Image Trace, the replacement for Live Trace. 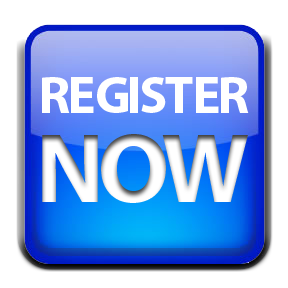 Live Trace has been replaced by Image Trace, which outpaces its predecessor in ease of use, efficiency, and speed. Thankfully, tracing is a considerably simpler process in Illustrator CS6. Along the top of the Image Trace panel you’ll find six distinct presets: Auto-Color, High Color, Low Color, Grayscale, Black and White, and Outline. All you need to do is select your image and click one of the preset icons; the trace occurs immediately. Image Trace is certainly much faster than its predecessor and delivers better quality tracing with fewer total objects. However, if you’re not quite satisfied with the preset’s output, you can always fine-tune the result. The Image Trace panel includes a color slider that controls the number of colors used, as well as path and corner sliders that adjust the complexity of the tracing. Also worth mentioning is Method, an entirely new option that lets you choose whether the tracing is Abutting or Overlapping. Abutting is the traditional method of tracing; Overlapping, on the other hand, creates layered objects that allow you to adjust anchor points without exposing the artboard underneath. This makes it much less frustrating to fine-tune your tracing, because adjusting points no longer creates small gaps in the artwork that need to be closed. Just one quibble: Image Trace and its predecessor allow you to ignore white, but that’s of little use if you have an image of a yellow tulip against a lilac wall. It would certainly be nice to have the option to ignore other colors (or even a narrow color range) in cases where the background of an image is predominantly one color. Illustrator is a mature application with a huge feature set, but as you might expect, not every feature gets revised with each new release. And unfortunately, that means a number of low-priority issues linger from update to update. The Star Tool remains very rudimentary and is in dire need of an upgrade. Illustrator users often find the application difficult to master because it requires constant toggling between tools, a chore that is most efficiently accomplished via keyboard shortcuts. Adobe would do well to examine ways it can streamline the standard toolset and minimize the reliance on shortcuts. A good example of this is the overlap in function between the Selection Tool (V) and the Direct Selection Tool (A). A number of competing vector apps have adopted a single selection tool with context-sensitive behavior, allowing moving, resizing, rotating, and editing of anchor points and paths without constantly toggling from one tool to another. Also, a number of Illustrator’s standard tools are still quite rudimentary and overdue for an upgrade. 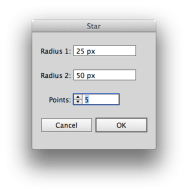 The Star and Rounded Rectangle tools are key examples; in both cases, the objects created by these tools have no special editing functionality. You cannot quickly change the number of points on the star, nor can you easily resize the corners on the rectangle; for such changes, you have to create the object all over again. In contrast, low-cost competitors tend to treat these items as smart objects. 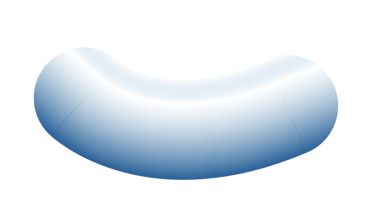 Artboard 1.4, for example, allows you to edit the number of points on a star, the curvature of its paths, and the distance between the peaks and valleys at any time. Finally, Illustrator’s bitmapped outline mode is an anachronism in 2012. An anti-aliased outline mode is optimal for the precision editing of paths, and it’s long overdue. 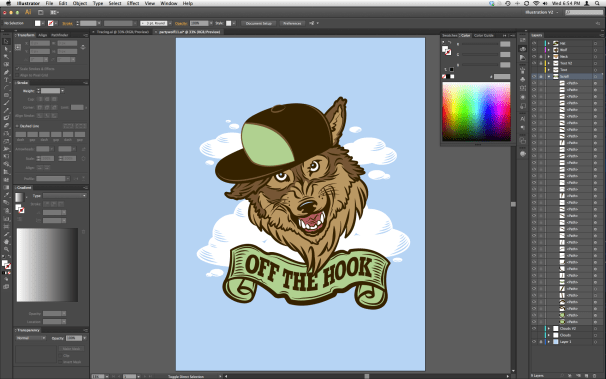 Adobe Illustrator continues to be a capable and comprehensive vector illustration package. Users of Illustrator CS4 (and earlier) will find a lot of compelling reasons to upgrade to version CS6, but the decision isn’t as clear-cut for users of CS5. 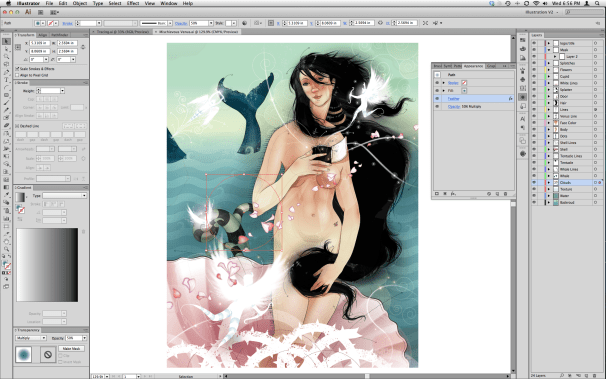 Overall, Illustrator CS6 feels less like a full upgrade and more like a refinement of the previous version. The updated user interface is gorgeous and there are modest performance gains, but those benefits alone are hardly worth the $249 upgrade price. Ultimately, the decision comes down to the appeal of the three new creative features: Gradient Strokes, Pattern Creation, and Image Trace. If you see yourself making heavy use of any of these tools, you’ll find upgrading from the previous version worthwhile.